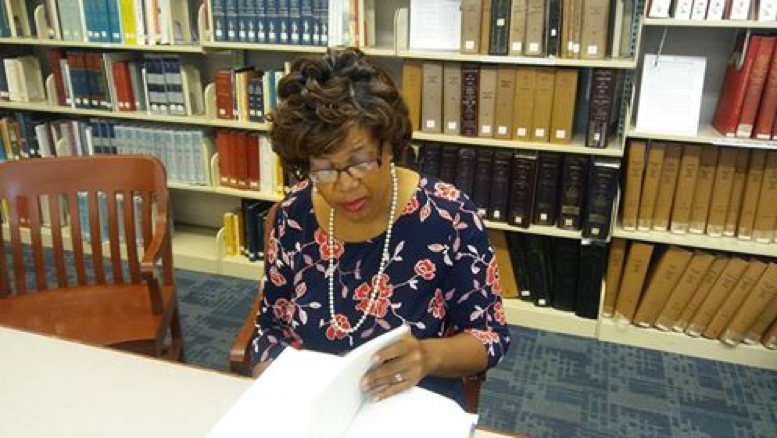 I visited the room for South Carolina History at the Charleston County Library in Charleston, South Carolina because I wanted to show you that you should not neglect to check Charleston church records back in 1720-1822 for African American genealogy. That’s right! The records I am choosing today comes from the Register St. Philip’s Parish. 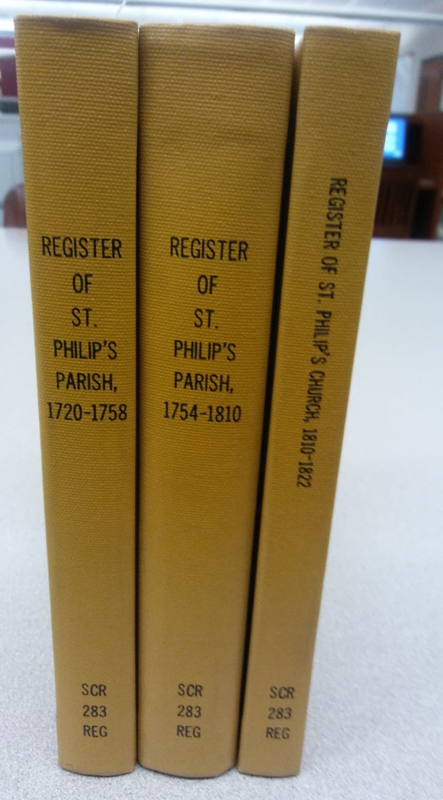 There are three books: Register of St. Philip’s Parish, 1720-1758, Register of St. Philip’s Parish, 1754-1810, and Register of St. Philip’s Church, 1810-1822. Robin R. Foster at the South Carolina History Room at Charleston County Library. Photo by Ellis McClure. You will be able to find registers of baptisms, confirmations, marriages, and burials from 1720 to 1822. 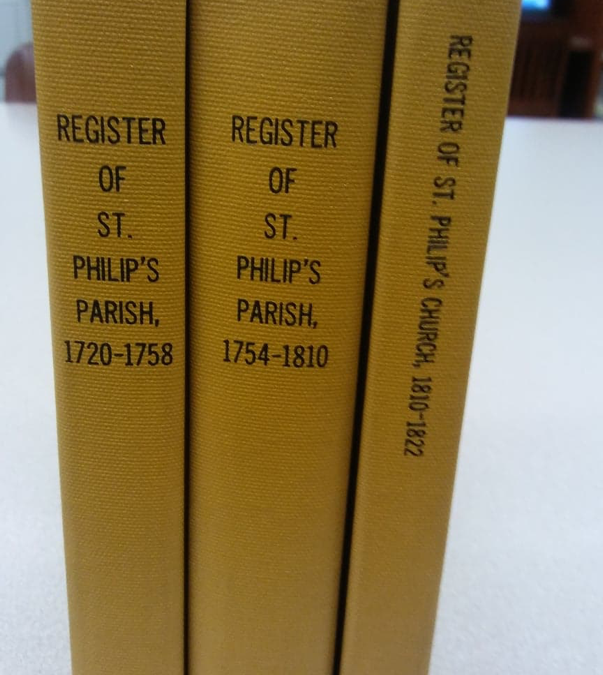 Register of St. Philip’s Parish, 1720-1758, Register of St. Philip’s Parish, 1754-1810, and Register of St. Philip’s Church, 1810-1822. Photo by Robin R. Foster. 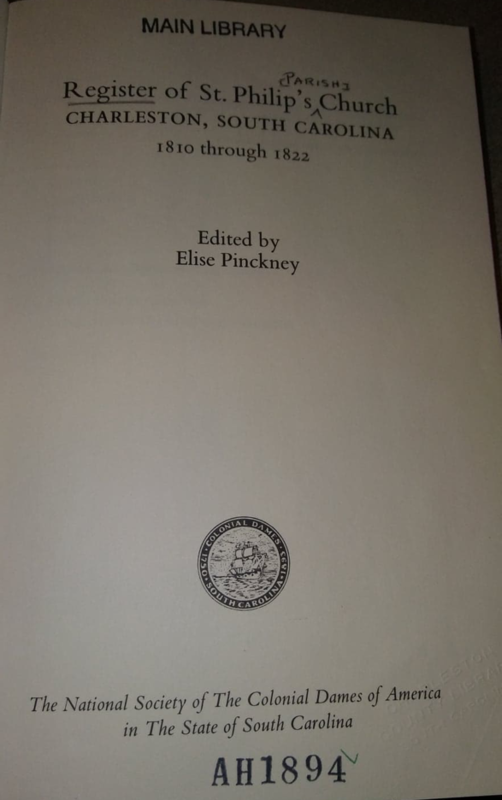 Let’s look in the book entitled Register of St. Philip’s Church Charleston, South Carolina 1810-1822. We would expect to find white parishioners, but can we find enslaved? How about free people of color? Let’s show an example of what a register look like. Register of St. Philip’s Church, 1810-1822. Photo by Robin R. Foster. 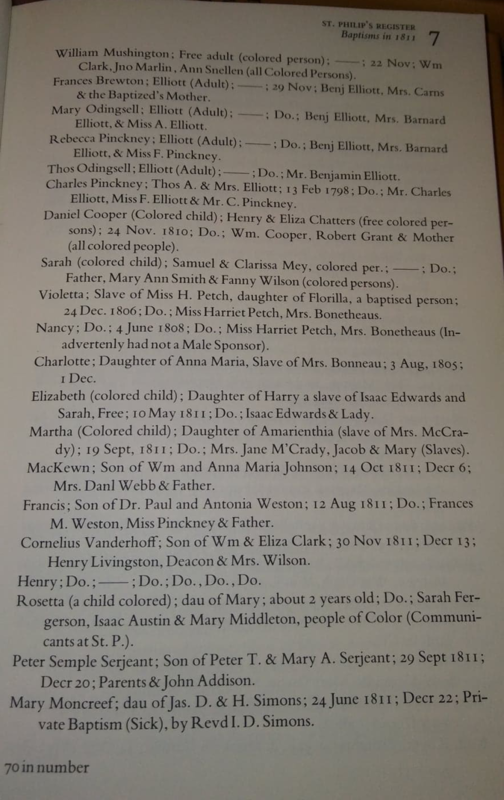 On page 7 of St. Philip’s Register of Baptisms in 1811, among white parishioners you will see free adult colored person, William Mushington and all Colored persons, Wm Clark, Jno. Marlin, and Ann Snellen. Violetta was enslaved by Miss H. Petch. Charlotte, daughter of Anna Maria, was enslaved by Mrs. Bonneau. A free colored child, Elizabeth, daughter of Harry. Martha, colored child, daughter of enslaved Amarienthia. Register of St. Philip’s Church, 1810-1822, page 7. Photo by Robin R. Foster. Hannah Mackenzie a free child of color. Daphne, an adult black, was enslaved of Mrs. Bonneau. Prince, an adult male, was enslaved by Wm. Johnson Esqr. Satyra was an adult person of color and enslaved by Mr. Vincent. Diana was an adult enslaved by Mrs. E. J. Rutledge. Rose was an adult person of color and enslaved by Mrs. Amey Blake. Thomas was an adult person of color enslaved by Miss Roberts. Register of St. Philip’s Church, 1810-1822, page 9. Photo by Robin R. Foster. The South Carolina Room has other local church records on microfiche. 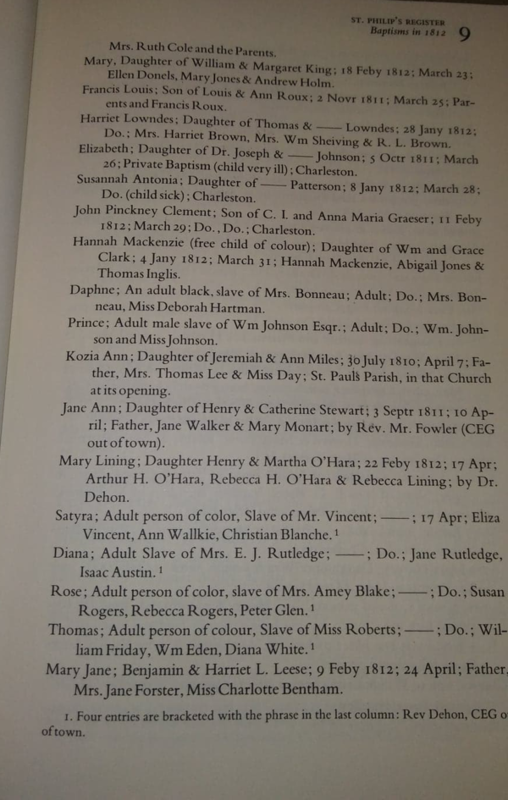 There is a finding aid in the South Carolina Room which lists the church, the location and the common names of slaveholders who were members. Please ask staff to view this finding aid. There is a FamilySearch Wiki page for St. Philips Church history, you can find it here. The earliest records of the St. Philips Church Register are digitized on Google Books, here: Register of St. Philip’s Parish Charles Town, South Carolina, 1720-1758. This is the only volume that has been digitized. This volume has been transcribed at Access Genealogy. We hope more editions will be digitized in the future. If your ancestor lived in Charleston during this period could they have been a parishioner of St. Phiip’s? Follow then link above for the earliest church records, which are online (1720-1758), and contact the South Carolina History Library South Carolina Room at Charleston County Library to access these books. Were they enslaved or a free person of color? Did you notice that name of enslaver was also given? What church did they attend later? Share your results in our Facebook Group.